Surf and sun and sand. Holiday heart and charming company. Spud was made for the picture! Full tobacco flavor! Cool, clean taste. Cigarette enjoyment that lasts the whole day long. Man! I thought it was going to be like the beer in the old Saturday Night Live sketch. Ohhhh SPUD! Spud, the beer that made Boise famous. They made cigarettes out of potatos? 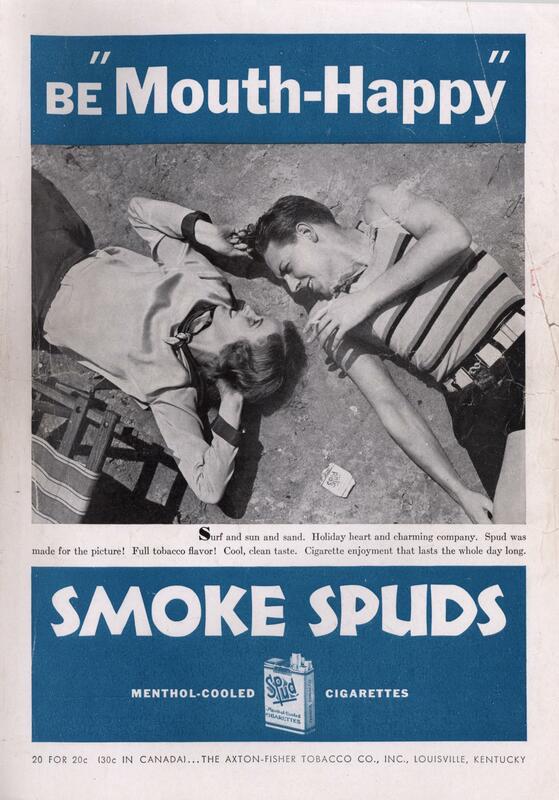 “Spud” was actually the nickname of the founder of the company, Lloyd “Spud” Hughes, the inventor of tobacco mentholation. He sold the rights to the patent and the company for $90,000, which he blew on fast cars, fast aircraft, and (I’m guessing) fast women. He spent the rest of his life trying to invent another unique cigarette. How the hell do you keep a spud lit! ?